In June of 2014 the previously obscure Islamist militia known as the Islamic State of Iraq and the Levant stormed over the Syrian border, into Western Iraq and onto the TV screens of millions of people around the world. Their initial blitzkrieg offensive culminated on the 29th of that month, with the proclamation of a caliphate by their leader Abu Bakr al-Baghdadi and the group renaming itself simply 'Islamic State'. A further offensive in August, directed against Kurdish territory to the West of Mosul, trapped thousands of Yazidi refugees atop Mount Sinjar and brought the first concerted Western intervention in the developing conflict. Since then the front lines have largely stabilised, with back and forth fighting mainly on the roads leading North and West out of Baghdad and in the area between Mosul and the Kurdish regional capital of Erbil. Neither Iraqi government or Islamic State forces have been able to break the deadlock thus far, both lacking the military capability to do so. The slightly better led and motivated Kurds seem unlikely to advance far outside their own territory. Broadly speaking the Iraqi Army has been poorly led and motivated, suffering especially badly in the face of mass desertions during the initial offensives of 2014. Its real strength though is the constant supply of US arms and equipment it can count upon. In comparison IS has appeared thus far to be well led and motivated, with its command structure built around a core of experienced ex-Iraqi Baathist officers and highly motivated Jihadist fighters. Their lack of a steady supply of arms, and likely inability to maintain the heavy equipment captured in Mosul and Syria over anything more than the short-term, may however prove to be their Achilles heel. If the war remains a drawn out attritional affair then it seems unlikely that IS will survive in the long-term. The Iraqi government forces will slowly improve as the pressures of war weed out the incompetent leaders, and protracted combat experience hardens their previously green troops. For IS though, a prolonged conflict almost certainly spells eventual defeat. Casualties amongst their mid and low level officers will prove increasingly difficult to replace with leaders of the same quality and skill. Once the group loses its tactical advantage, afforded to them by competent battlefield leaders, it will start losing. The higher ups will be unable to impose greater central control to counteract the effects of this attrition, because of the limits placed on electronic communication by Coalition signals intelligence aircraft. If they decide to lead from the front they too will be exposing themselves to injury or death. It seems then that the current US strategy of 'degrading' IS will eventually prove successful and result in the defeat of the group. However, while their logic is sound the consequences of a victory won by slow grinding pressure on IS in Iraq will likely prove catastrophic for the people of Western Iraq and the region. As IS is slowly ground down it will inevitably press ever more of the population it controls into military service. We have seen what this sort of victory looks like before, a country of old women and young children living amidst the rubble of towns and cities leveled by fighting. Even with the enormous Marshal aid programme it took Germany more than thirty years to rebuild much of its infrastructure and, make no mistake, there will be no such comprehensive programme for the reconstruction of Iraq. This doesn't even begin to address the even greater numbers of people that will be displaced as the Iraqi army drives IS back street by street, adding to the more than 4 million people already displaced by the wars against IS. A vast swathe of the Iraqi state will effectively be reduced to prolonged and extreme poverty and hardship. This could very well breed the next generation of jihadist fighters to throw Iraqi state into another prolonged conflict it can ill afford. In human terms alone this is a victory that Iraq and the West cannot afford to win, especially if blame for the current conflict continues to be laid at the foot of the US and UK for initiating the 2003 invasion. The involvement of regional powers is not a real solution to the problems Iraq faces either. As we have seen with Turkey's recent involvement in the conflict, directing most of its bombing against the Kurds rather than IS, most of the region's powers have ulterior motives or too much at stake to risk involvement. The conflict is likely already another outlet for the Middle Eastern Cold War between the major Sunni and Shia powers, Saudi Arabia and Iran. Of all the regional powers Egypt and Jordan would seem best suited as allies in the fight against IS, but like all things in that area of the world once action is taken things tend to become very complicated indeed. Some commentators, Malcom Rifkind among them, have suggested alignment with President Assad's beleaguered regime under the idea that 'my enemy's enemy is my friend'. Despite evidence that suggests that the Baathist regime has engaged in a truce with IS, so that both sides can focus on destroying what remains of the Free Syrian Army. Russia can play the game of supporting President Assad's 'lesser evil' but the West has come too far, by supporting the FSA and threatening to bomb the regime over the use of chemical weapons, to go down this path now. 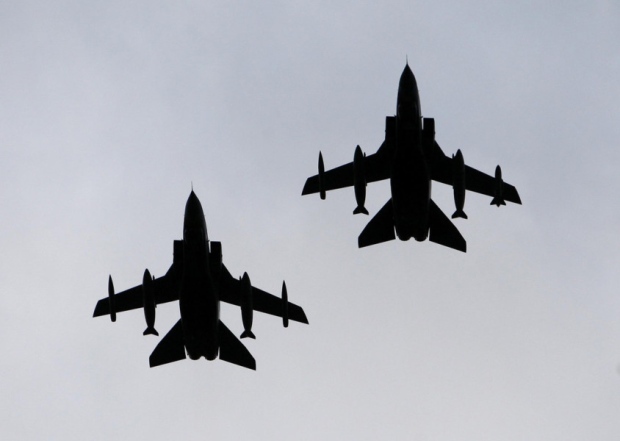 So what is Britain currently doing to combat IS? Operation Shader is the UK's tri-service military effort in Iraq, led by the efforts of the RAF's 903rd Expeditionary Air Wing flying out of the Akrotiri air base on Cyprus. The ten MQ-9A Reaper drones, eight Tornado GR4s and Tomahawk-armed nuclear powered submarine form the sum total of the UK's striking forces currently in the region. The range of intelligence gathering assets deployed is certainly the key British contribution to the bombing campaign. The two Sentry AEW, and four assorted Shadow, Sentinel and Rivet Joint reconnaissance aircraft, as well as special forces teams on the ground provide a robust array of assets that enable the use of coalition air power. This is especially important for the smaller European and regional coalition members who tend to possess strike aircraft but lack the support and intelligence gathering assets necessary for effective targeting. Alongside these striking forces are two battalions from the Yorkshire and the Princess of Wales' Royal Regiments, stationed in Iraq to provide training to the Iraqi Army and Kurdish forces. The current level of commitment and military engagement by the UK is commensurate with the requirements of the current US-led attrition strategy. Small numbers of combat aircraft, flying missions principally directed against the logistical and command structure of IS, will succeed in the slow degradation of the combat capabilities of IS. However, as previously discussed, the current attritional strategy is destined to produce disastrous results for the areas of Iraq occupied by IS. If the current coalition strategy of slow attrition and building up the Iraqi Army is destined to result in a Pyrrhic victory that will be catastrophic for Iraq, and likely continue to propagate instability within the country and in the wider region. What I would suggest is that Britain argues the case for a different strategy altogether. Intervention on the ground and a 'counter blitzkrieg'. 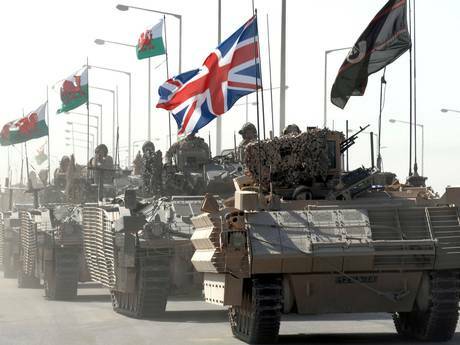 To call this option controversial is a gross understatement, for Britain and the United States the scars of the 2003 war are still uncomfortably fresh. Even the phrase 'boots on the ground' has become politically toxic and shifting public opinion on the issue will take time, concerted effort and critically honesty on the part of Western political leaders. There can be no 'dodgy dossiers' this time, no lying to the public. Yet, in spite of the very significant political problems, it is what must be done if we are to avoid incalculable damage to the Iraqi state and regional stability. So how would a Western ground war against IS prove less damaging to the country than the current Iraqi-led ground war? Firstly, the speed that Western armed forces can move and fight at would almost certainly take IS by surprise. Their role would be to conduct the 'blitzkrieg', small powerful armored formations that drive deep into IS held territory, disrupt logistics, sow confusion and ferment panic amongst disoriented and isolated troops. The aim would be to keep the amount of fighting that takes place in built up areas to a minimum, engaging always with overwhelming force but only when absolutely necessary. Following this Western advanced guard would be the Iraqi Army, who would be tasked with reducing the significant pockets of IS forces that had been cut off by the armored spearheads and garrisoning liberated areas. Speed, logistical damage and the rapid capture of enemy territory would substitute for the current strategy of slow attrition. As for an exit strategy, we already have one - continue to build up the Iraqi Army as an inclusive national force with Sunni elements capable of securing their own communities in tandem with local actors, as per the Anbar Awakening of 2006. Some Western troops would have to remain to secure the Syrian border and block further IS incursions, but a large scale 2003 style occupation would be unnecessary. I make no suggestion that Western troops will not be killed if we choose to conduct this sort of operation, but the sacrifice of a few will save the lives of countless Iraqis, who would otherwise be pressed into military service by IS or have their homes destroyed by prolonged back and forth urban fighting. If we are truly humanitarians, concerned with the fate of the Iraqi people, then this is the only option available to us. If we do this, and do it properly then maybe, just maybe, we can put the ghosts of the last war to bed. For good this time.